To enter Inkprint Mathematics Notation into DBT Win 12.4 sr1, you need to be familiar with mathematical notation and you need to make use of one of several additional software products. If you are not knowledgeable on braille mathematics, make sure your work is checked by a proofreader until you thoroughly know your abilities and limits. While Duxbury Systems is recommending third-party software, please note that the general use and support for these products is generally provided by the developer and not Duxbury Systems. Inc. Issues relating to import and braille translation however can be addressed to Duxbury Systems. Enter math in DBT itself. Use MathType to create math in a BANA template Word document to open in DBT. Enter math in MS Word direcly using tools build into Word's autocorrect system; then convert to MathType. Use Scientific Notebook to create a .tex file to open in DBT. Work with a TeX or LaTeX file created in other ways, perhaps written out by a math professor or created from math OCR with InftyReader. DBT does not offer an extensive array of tools to help you with direct math entry. MathType is recommended for several reasons. There are good math data entry and editing tools, good ability to structure the braille format, and a sighted-friendly view of the math. Using the autocorrect method for entering mathematics in Word and then converting to MathType offers most or all of the advantages of using MathType directly and is also more accessible. To convert to Mathtype, select all text, then use the Mathtype menu Format,Convert, then OMML to Mathtype. Scientific Notebook is still popular. Not as many tools for formatting the braille as when working with Word and the BANA template. LaTeX files from professors or from InftyReader are Very nice when available, most often in colleges. In general, our recommendation is to use Word with MathType and the Word BANA Braille template. This gives you good tools for creating and displaying the math and for getting the desired BANA format. MathType is fairly inexpensive, especially for schools. Some schools already have multi-user licenses for other purposes. DBT Win 12.4 sr1 was released in March 12, 2019. Use Help, Check for Updates to make sure you are using this version. Please use the English (UEB) - BANA with NemethDBT Template. SWIFT 5.2 is a free product from Duxbury Systems that was released in late March 2016. Install SWIFT 5.2 from See the section below about setting up SWIFT and Word. Microsoft Word is available from many sources. 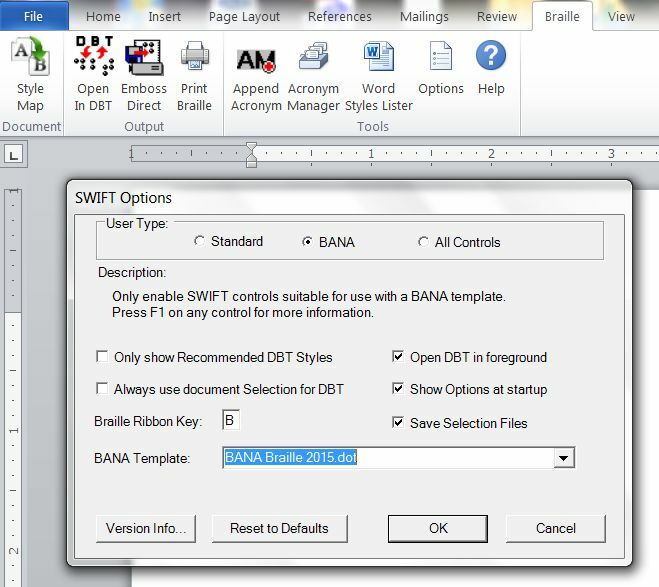 The BANA Braille 2017 Template is supplied with DBT Win 12.4 sr1; SWIFT 5.2 makes it easy to attach this Word template to your Word documents. Mathtype is available from Wiris for the price of $97 (academic price $57). MathType is a mathematics formula editor developed by Wiris. MathType users construct math and science equations in a WYSIWYG environment. These formulas are embedded in Microsoft Word documents. Mathtype is not a free program, but is relatively inexpensive. 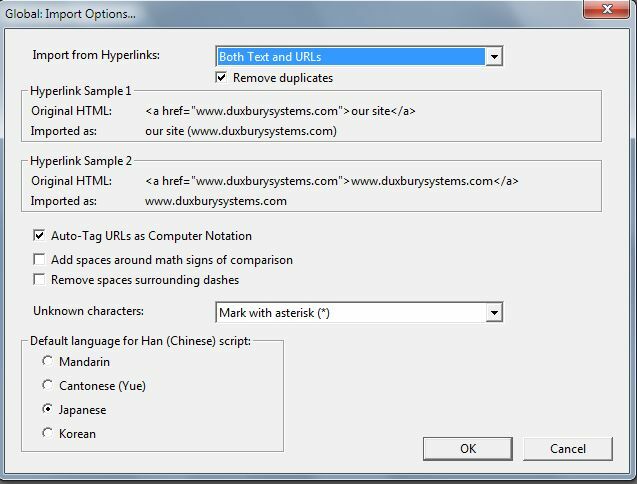 You need to install Mathtype in order to import Word documents with equations into DBT Win 12.4 sr1. Installing SWIFT adds a Braille Tab in MS Word. This is shown on the top right of the above graphic. Your first step should be to go to the options menu in SWIFT and check BANA as your User type. The style math is for technical notation. In the braille translation with this DBT template a segment in the math style has been translated to Nemeth Code and has the start and end Nemeth indicators around it, spaced .=_% and .=_: (dots 456, 146 and dots 456, 156). The style math-TextInMath is intended for use within the math style for enclosed nontechnical notation. In braille, the style math-TextInMath does not add any start or end Nemeth indicators. The braille for the math-TextInMath style in this DBT template is in Nemeth context, with Nemeth digits, the Nemeth punctuation indicator and grouping signs, etc. ; it uses no contractions. The style OneWordBridge is intended for one word separating two segments of technical notation. In braille, the word appears in UEB with unspaced dots 6, 3 (the one-word switch) before it. To apply a style in DBT, highlight some text, press F8, and select the correct DBT style from the list. To understand the basics, let's start with working entirely in DBT, without using Microsoft Word, MathType, or Scientific Notebook. The number 12 followed by period can appear in braille in three different forms in this template. Any MathType object automatically creates the math style in DBT, and any use of MathType's text style within an object automatically creates the style math-TextInMath in DBT. Each MathType object will create a separate use of the math style, with its own use of the start and end Nemeth indicators. To avoid that, create a pass through in math section in Word around the desired MathType objects, by inserting special start and end tags. The buttons for starting and ending a pass through in math section are currently called Text In Math Start and Text In Math End (we plan to rename them). These insert the invisible codes [[*idle~ptims*]] and [[*idle~ptime*]] (ptim for pass through in math, with s for start and e for end). You can think of each MathType object as a pearl. A pass through in math section strings them together. It turns the whole section into one necklace in the math style, with everything outside of the math style (the string) in the math-TextInMath style. A pass through in math section does its work as DBT is importing the file. The above was based on a presentation by Caryn Navy at the 2016 CTEBVI conference. Click here for pdf of the presentation handout, click here for the zipped sample files. 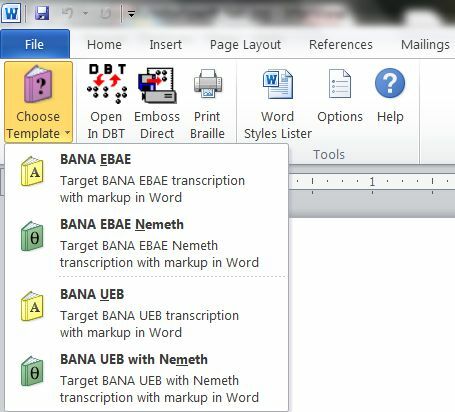 Whichever method you use to create files for producing UEB braille, it is best to use the DBT template called English (UEB) - BANA. In the United Kingdom, use the DBT template called English (UEB) - UK Formatting. The style math is for technical notation. The style math-TextInMath is intended for use within the math style for enclosed nontechnical notation. When importing from Word documents with MathType objects, the MathType objects are assigned the math style. Similarly, when importing from a LaTeX file, the items in math mode are assigned the math style. Familiarize yourself with the UEB symbols. Using DBT can help with this. If DBT's UEB translation table does not know the UEB braille for a particular print symbol, translation of that print symbol will give the UEB shape symbol for U+####, where #### is the Unicode number for the print symbol. If adding spaces around signs of comparison or around both signs of comparison and signs of operation, use appropriate tools to do this consistently. Know the general guidelines for use of the grade 1 indicator in math. Pay attention to how and where to break the line in a long math expression that has no spaces. Why is the Math Style Important? When importing from Word/MathType or from a LaTeX file, any adding of spaces that happens during importing happens only in the items marked in the math style. Spaces are added around signs of comparison in math items if you have set that up in DBT's Global settings. During file import, within math items, spaces are added to the left of those function names that are preceded by technical notation without a space, as in xsin theta!! On the print side in DBT, you can use a hyphen as a shortcut inside the math style for entering the minus sign character. Inside the math style it becomes the UEB minus sign, dots 5, 36; outside of the math style it is treated like a hyphen. Any DBT code that affects UEB math translation is effective only within the math style. One such code is the [utpN] code, where N is 0, 1, or 2. There is an option in UEB to add spaces around signs of comparison, like the equals sign and less than sign, around both signs of comparison and signs of operation, like the plus sign, or around neither of these. Adding spaces around only signs of comparison seems to be the most common preference for UEB transcribers, except that those producing material for students in the first few grades may want to add spaces around signs of operation as well. For DBT users adding spaces around signs of comparison only, there is an option to have these spaces added around signs of comparison as you import a Word or LaTeX file. We will also look into adding an option like this for adding spaces around signs of operation. Previously we recommended use of the DBT code [amspN] for setting up the adding of spaces around signs of comparison or both signs of comparison and signs of operation. That code still works, but we are downplaying it, because it can have some unwanted side effects. That led us to creating the import option for adding spaces around signs of comparison. The default of [amsp0] does not add any spaces. [amsp1] adds spaces around signs of comparison. [amsp3] adds spaces around both signs of comparison and signs of operation (common usage for early elementary school students). Click here for an excerpt from Unified English Braille Guidelines for Technical Material which explain the role of grade one indicators in UEB math. As mentioned above, UEB gives some leeway for deciding when and where to use grade one character, word, and passage indicators in math, with more than one correct result. If you do not like some of the choices that DBT makes in this regard, you can influence DBT's decisions with a [utpN] code. utp stands for "use transcriber preference." The N is the number 0, 1, or 2 as described below. [utp0] -- Use dBT's default logic on this; the same as using no [utpN] code. [utp1] -- favor grade 1 math usage, with more use of grade 1 word or passage indicators. [utp2] -- favor grade 2 math usage, with less use of grade 1 word and passage indicators. Just Nemeth braille in DBT (everything is in math mode). Use the Math Notation (Nemeth 1972 math mode only) Template. With this template, writing math is easy, writing text is harder. See How to Write These Files (below). A mixture of literary braille text and math Nemeth braille. Use the English text with math Template that you create yourself. See Save the Math Template for Your Own Use (below). A UEB file, which can mix UEB literary text with UEB math. Use the English (Unified) Template. When BANA voted to adopt UEB in the United States, the vote included maintaining Nemeth Code for technical material. Thus UEB math has a more limited role in the US. A blind student can enter math in Nemeth code for a Sighted Teacher. This requires the use of third part software. One such product, Scientific Viewer from MacKichan Software, is freeware. Using Scientific Viewer, you can open the LaTeX file produced by DBT Win 12.4 sr1. You can view the inkprint mathematics notation on the screen, or print it out.